OXFORD, Miss. 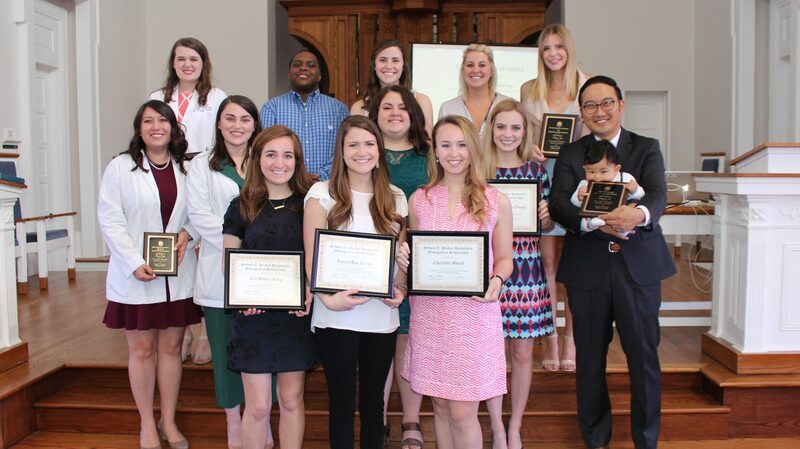 – The Department of Nutrition and Hospitality Management in the University of Mississippi School of Applied Sciences recently honored 23 students enrolled in its programs of study at an honors reception. Dean Peter Grandjean welcomed friends and family to the April 3 celebration of student accomplishments following a welcome from David Joung, assistant professor and chair of the scholarships and awards committee, and opening remarks from Yunhee Chang, interim department chair and graduate program coordinator. 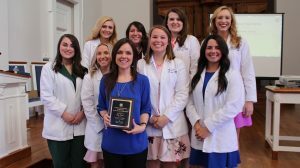 Janie Cole, director of the coordinated program in dietetics, or CPD, recognized eight students for completing the 36 hours of graduate coursework, including 1,325 hours of supervised practice under the supervision of a licensed registered dietitian needed to graduate and sit for the R.D. exam. The program touts a 100 percent pass rate for the R.D. exam. Preceptors are practicing registered dietitians who supervise practice for CPD students. Cole recognized Hope Guthrie, of Baptist Memorial Hospital-North Mississippi as Outstanding Preceptor of the Year. Chang presented the NHM Faculty Award to hospitality management student Randi Patterson, of Florence. The School of Applied Sciences, home of the Department of Nutrition and Hospitality Management, offers professional preparation programs that integrate academic study, clinical training, creative research, service-learning and community outreach, leading to the development of leaders whose professional endeavors will improve health and well-being.